It’s the most wonderful time of the year… for Apple die-hards. For everyone else, this year’s launch event fell a bit flat, with social media responses indicating less excitement for new items than in the past. The announcement elicited a few responses of “Oh, that’s interesting” from me, but admittedly, I wasn’t as psyched as I have been in recent years. But, as Dave Smith wrote for Business Insider, “Even a yawn-inducing Apple event like Wednesday’s launch is better than most events or conferences thrown by rival tech companies, which are typically slow, boring affairs that usually reveal some kind of fundamental disconnect with their audience.” The one updated product that caught my attention this year was the Apple Watch, a product I don’t currently own but that has now piqued my interest. Regardless of how you felt about what Tim Cook revealed on September 12, the Apple Watch upgrades carry exciting implications for a variety of audiences, including the elderly. Fans of the Watch can look forward to a new display on the Series 4 that conforms more to the size and the shape of the physical watch face borders. Its screen is more than 30 percent larger than that of the previous model while still featuring a thinner case size. This new-and-improved face can hold up to eight complications, which are any functions on a watch besides its basic time-telling function (and yes, I had to look that up). One such complication that will likely come in handy for many is the ability to add the icons of friends or family members, who can then be contacted simply by tapping their icon. Series 4’s digital crown will also have haptic feedback (the vibrations you feel when pressing an app or unlocking your phone, for example). The watch’s speaker will be 50 percent louder, and to reduce the echo on phone calls, its microphone has been moved as far away from its speaker as possible. The watch’s new black ceramic and sapphire crystal backing will help users enjoy better cell reception, as radio waves can now pass through both the front and back of the watch. The new watch generated the most excitement with the announcement of its new health-related features. 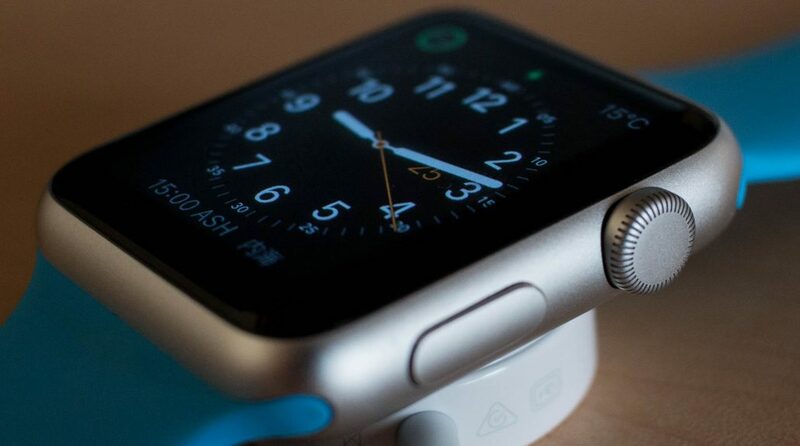 The fourth generation Apple Watch will be able to detect when its wearer has fallen by “analyzing risk trajectory and impact acceleration.” Once a fall has been detected, the watch face will flash an alert and give the wearer an option to dial emergency services. Move over, Life Alert. For those who worry about elderly relatives living alone, this watch could be a great gift to ensure their safety when you’re not around. The new watch can also keep track of your heart rhythm and notify you if it senses any symptoms of atrial fibrillation, and a new electrical heart sensor will allow users to take electrocardiograms. I for one welcome our robot overlords if it means they’ll lovingly let us know when something is amiss with our circulatory system. That sounds much more Baymax and much less Terminator to me. What wasn’t mentioned in the keynote, however, is that the irregular heartbeat notifications and the ECG app won’t be released until later this year, so they won’t be available at launch. Despite these new capabilities, Series 4 still has the same 18-hour battery life as its predecessor. The starting price for GPS (no connection to a cellular plan) is $399, while the starting price for cellular is $499. The Series 4 is currently available for preorder and will be released tomorrow. In more budget-friendly news, the starting price for the third-generation Apple Watch has been bumped down to $279. What did you think of this year’s Apple Keynote? Did anything in particular capture your attention, and will you be buying any of the updated products?